In this edition of the acclaimed series, editor Charles Brooks displays, once again, his talent for choosing the most memorable, irreverent, and, at times, poignant artistry of todayís most gifted cartoonists. 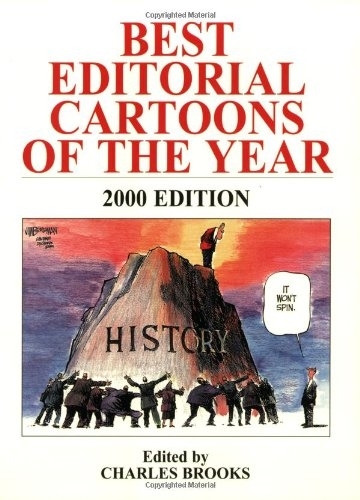 His selection of top editorial cartoons from the United States and Canada runs the gamut, from presidential antics and political posturings to drawings that comment on almost every aspect of modern daily life. From sports, education, health care, and the news media to crime, gun control, and the economy, Brooks gives the reader pictures that are truly worth a thousand words. Best Editorial Cartoons lovers will laugh as they encounter hilarious caricatures of VIPs, view renderings of the common man facing lifeís incongruities, and see the foibles of society revealed in over 400 sketches. Brooksí twenty-eighth volume includes David Horseyís Pulitzer Prize-winning work from the Seattle Post-Intelligencer , as well as those of other talented and award-winning artists who have earned distinctions over the past year. In addition to the cartoons, the book also contains introductory comments putting each section in a historical and social perspective. With contributions from some 160 cartoonists, this latest work is sure to be recognized as one of the best of the Best series. CHARLES BROOKS, a former president of the Association of American Editorial Cartoonists, has edited this series since its inception in 1972. Brooks served for 38 years as editorial cartoonist for the Birmingham News, where his work won numerous national awards.